A stunning resort set in Thailand's most exclusive Marina. It is situated on the east coast of Phuket, renowned as a very popular holiday destination. 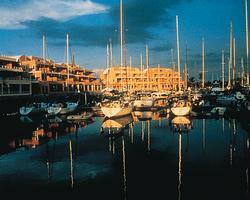 A base for the annual King's Cup Regatta, it is often compared to France's Port Grimaud and Marbella's Puerto Banus. Along the boardwalk, visit the exclusive shops. Enjoy a meal at the waterside restaurants or spend a lazy day by the pool. Or you may want to take off to a private pearl island, which is just nearby and takes 30 minutes by speedboat. There is a pearl shop, exhibition, seafood restaurant and a peaceful beach there.